Star Trek: Discovery Magazine, Featuring STO! Star Trek Online is featured in Star Trek Discovery: The Official Companion magazine, out today! Get your hands on a copy of the magazine to see a full page spread on STO, and to get a code for awesome rewards! 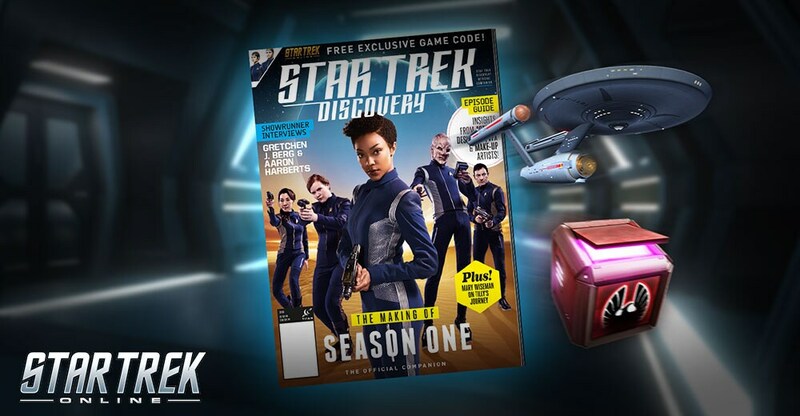 Each copy of The Official Companion comes with a code to get the Discovery Uniform in game, three Phoenix Prize Packs, a Large XP Boost, and a Tier 1 Constitution Class starship! Star Trek: Discovery: The Official Companion magazine is the ultimate guide to the making of the smash hit series. Episode by episode, the companion delves behind the scenes of the show, charting the triumphs and challenges of the first season – from script to production design to visual effects – as related by key creative personnel from both sides of the camera.